Several week ago, we posted about a new cichlid display tank in our retail store Fish Room. Not far from that tank, we have another new display tank with a very different look and theme. This tank was designed and set up by myself and former Fish Room supervisor and biologist, Sara Stevens. 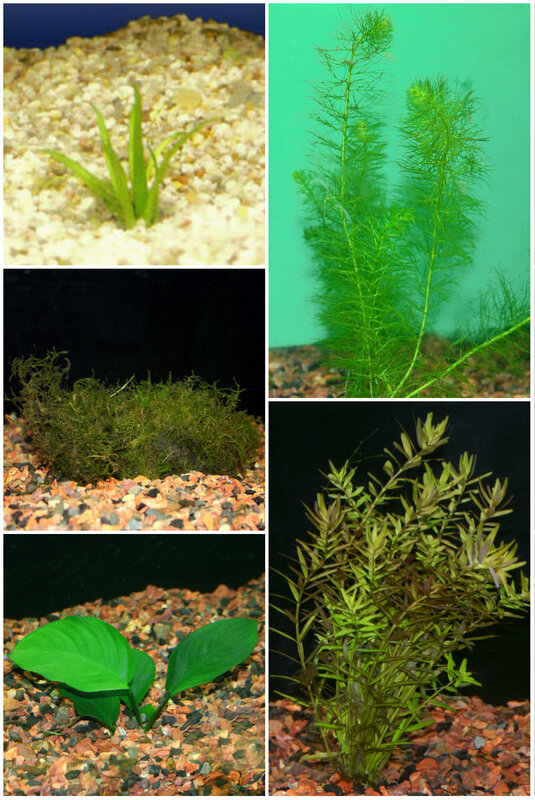 We were inspired by the style of the world-famous Takashi Amano, an aquarist who popularized mind-blowing freshwater tanks designed to resemble terrestrial forest and landscapes. These tanks have a higher focus on the aquascaping and livestock is chosen as a compliment rather than the focus of the tank. While our tank doesn’t completely follow the true Amano style, we still wanted to focus on taking the aquarium out of the underwater setting and give it more of a land-based feel. We love the look of the petrified wood available at our retail store and decided to use this rock as our centerpiece. The petrified wood has a color and texture a lot like that found in canyons so we made use of perspective and the space available in the 60-gallon cube tank to create a large cliff face in the back and a smaller rockmount in the front, which meet in the back corner, giving us a “river” diagonally down the center of the tank. To create even more of a “river” appearance, we lined this canyon with pond liner to separate the fine white sand representing the river itself from the black Eco-Complete plant substrate in the rest of the tank. Sara did a great job of arranging the rockwork to add the illusion of depth as the river flows from the back to the front. Instead of a traditional underwater aquarium background, we used a desert background that turned out to be an excellent complement to our theme! The live plants in the aquarium were all chosen to represent the forest surrounding our canyon and the plants growing down the riverbed. 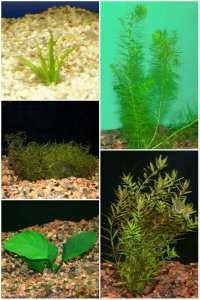 In any planted tank like this, the aquascaping will take time to grow in and become established. We wanted an almost overgrown look with the plants over time so we chose plants that would grow and spread. 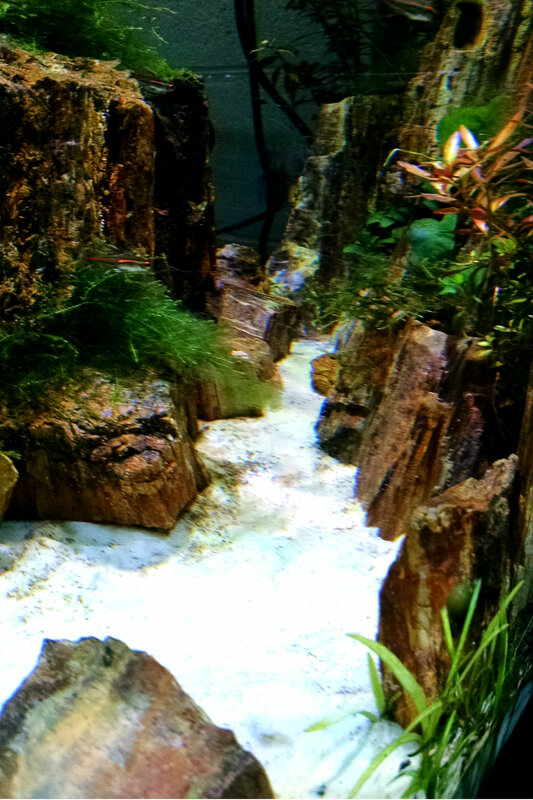 Plants were chosen that can grow and root into the cracks of the petrified wood and I plan to also establish low, carpeting plants in the foreground of the tank. The bunched plants in the background were chosen with a gradient in leaf size and color for a transitional, ombre look. The fish and invertebrates in the tank were some of the last additions we settled on. 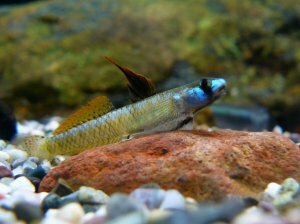 While Amano’s tanks use a lot of small, schooling fish like Neon Tetras (if any fish at all), we wanted to use some of the more overlooked fish in our Fish Room to show how gorgeous they can be when established in the right tank. The stars of this tank are several pairs of Forktail Rainbows. Their body shape and swimming style makes them the hawks circling high above our river canyon and the color they’ve developed is a great complement to the rockwork and plants. We added a school of Glowlight Tetras for some additional color and movement as well as a few pairs of a gorgeous freshwater goby known only by its scientific name, Stiphodon percnopterygionus (who we’ve taken to calling these little guys “Pterodactyl Gobies” because that scientific name is a mouthful, even for us!). Most recently, we’ve also added a few Marbled Hatchetfish for some extra surface movement and a True Siamese Algae Eater and freshwater Nerite Snails to help with cleanup. Visit our Retail Store to see this tank morph and grow! In a tank like this one, pre-planning is important. We had a concept drawn out before we started and made some adaptations to it as we went along (the original design had a sand volcano erupting in the back and spilling sand down a rockface) but all of the adaptations were made while keeping the overall look, theme and the future appearance of the tank in mind. 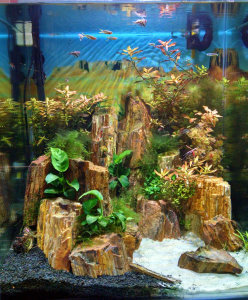 Since the plants will take time to get to the look we had in mind while starting the tank, this kind of design and aquascaping isn’t one for an aquarist wanting a finished product right away. But, with a little planning, patience and imagination, you can end up with a gorgeously original display far from the average aquarium. Visit our Lancaster, PA retail store to see how this landscape grows or to create your own! 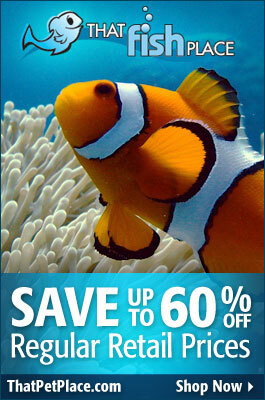 Here at That Fish Place – That Pet Place, our retail store display tanks are ever-changing. Whether we add some new livestock, hook up the latest equipment or simply get bored with what’s out there, our tanks are in a constant state of flux. This blog takes a look at a few of these displays, and points out a couple highlights about their designs and the staff whom maintain them here at the store. As always, if you have any questions or comments regarding specifics or anything else about the tanks, feel free to shoot us an email at marinebio@thatpetplace.com or hit us up on Facebook or Twitter. Cory’s gorgeous planted tank is highlighted by a wealth of aquatic plants. Including Pearl Grass, Water Sprites and a Tiger Lotus. The community fish setup includes a koi freshwater angel and various tetras. Check our our Facebook page for additional pictures of all of our store displays, past and present. We’ll highlight updates to our larger displays in a later blog.